It’s time to put your bread crumb making skills to delicious use. 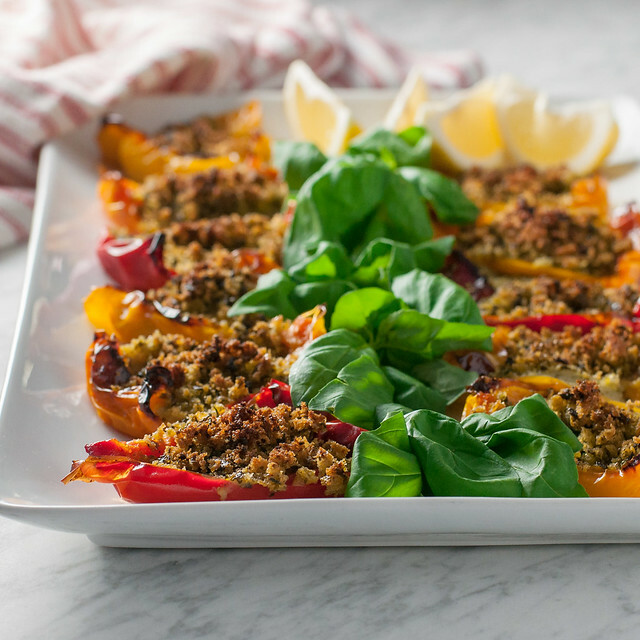 After a recent large get together at which everyone’s appetite for crudité was particularly small, I found myself left with one of those big Costco 6-packs of bell peppers, pining for this delicious appetizer that I stumbled upon last summer. Some days (i.e., every day), when the declining culinary I.Q. of Bon Appetit makes me especially disgruntled, I flip through old issues, remembering the glory days of a magazine that, at one time, inspired me. Nowadays it does little more than inform me how cronuts are a thing and that game day food equals meat and how everyone and their mom should move or take a culinary vacation to NYC because it is, like, the best food city that obviously invented every food trend and has the only good ice cream in the country. 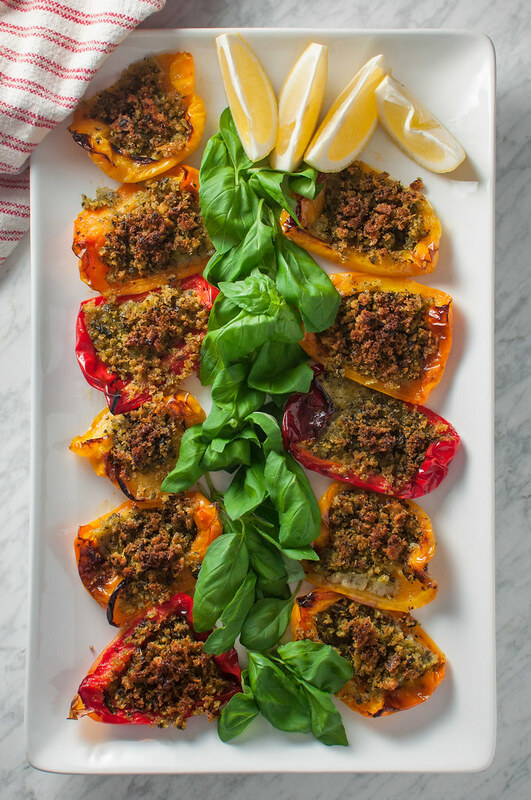 But, BA did give me the inspiration for this stuffed rainbow peppers recipe. I both love and hate these little bites, but mostly love, because I could sit down with a glass of wine and an issue of Saveur (zing) and pretty much eat the whole platter. On the downside, the recipe is a bit time consuming (albeit mostly inactive time), but it truly can be prepared hours in advance and left sitting at room temperature without any harm to the flavor. Your guests will rave regardless of the temperature at which you serve this bready pepper appetizer. They pair well with any type of party I frequent. Pizza, which is always particularly difficult to eat after a heavy appetizer, is the perfect example. Serve them at holidays year round, with a Mediterranean menu, a tapas selection, or even at a picnic. Assigned to bring an appetizer? While I would never complain about the standby deviled eggs or go-to rosemary cashews, this one will break the mold and, if you thrive on compliments, get you a few of those, too. Just don’t make the mistake I did last summer, assuming guests would leave me a pepper or two to sample. Get in there and stake your claim early. 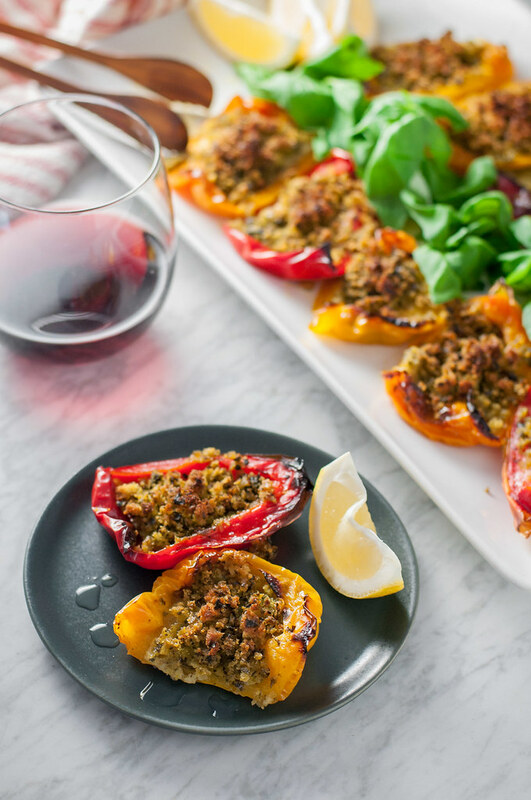 It’s not really helpful to your party game for me to post this bread crumb pepper recipe on Super Bowl Sunday, but I have other reasons for the timing, and hopefully you found no shortage of less refined appetizers for today’s game. I’m releasing the recipe today because it follows the first official tutorial in NCK’s new homemade how-to series. Every couple weeks, I’ll teach one of my favorite or most essential home cooking skills, followed by a recipe to put that skill to work. If you haven’t deduced by now, this “episode’s” skill is how to make homemade bread crumbs. Bread crumbs make everything better, and if you haven’t made them yourself, you’re not living (or something). Hop on over here to check out the how-to post. Feedback welcome! Oh hello, Clarence! Are you inserting yourself into the blog like you are into every place on the floor I’m trying to stand? I haven’t shared an adequate update on the pup since I admitted the difficulty of what I thought was my dream–a puglet. Things have taken a major turn for the better. Long-ish story made short, Clarence (and parents) got a visit from Mike the dog trainer who should really re-brand himself Mike the miraculous puppy transformer. I think his tactics are similar to the dog whisperer, but we have a whole new system going in which Clarence stays the heck away from sticks of butter dropped on the floor and any feet he can get his teeth on, in favor of hourly snuggles and backing away any time I open the fridge, which is often. He has patience. I’m so thankful we could afford that training session, and while we still have a lot of practice ahead of us, I’m so in love with this dog now that I actually go pick him up early from day care because I miss him. If you find yourself in the kitchen making an NCK recipe, I’d love for you to Instagram it and tag us, but know what I’d love even more? 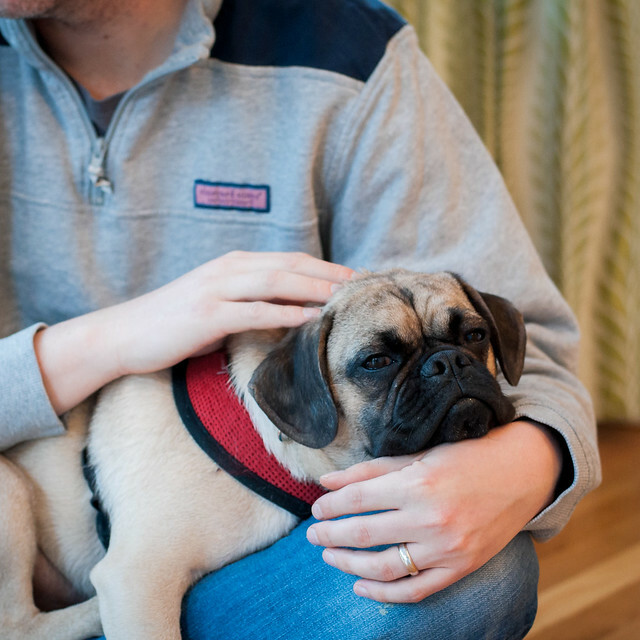 Feature your furry friend in the photo! Because I’m apparently a late blooming dog lover. Vegan. After mastering homemade fresh breadcrumbs, this is a must-make appetizer. It can be prepared up to four hours ahead, so make it first as you get ready for your next dinner party. When guests arrived, they'll be greeted with a colorful snack and you'll have had ample time to finish the other cooking. Preheat oven to 400 (F). 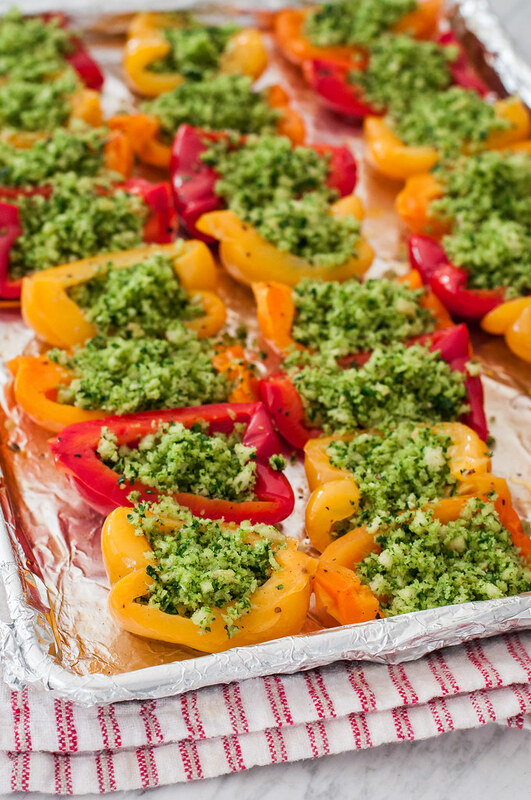 Line a rimmed half sheet pan with foil. Quarter peppers lengthwise and remove stem, seeds, and white membranes. 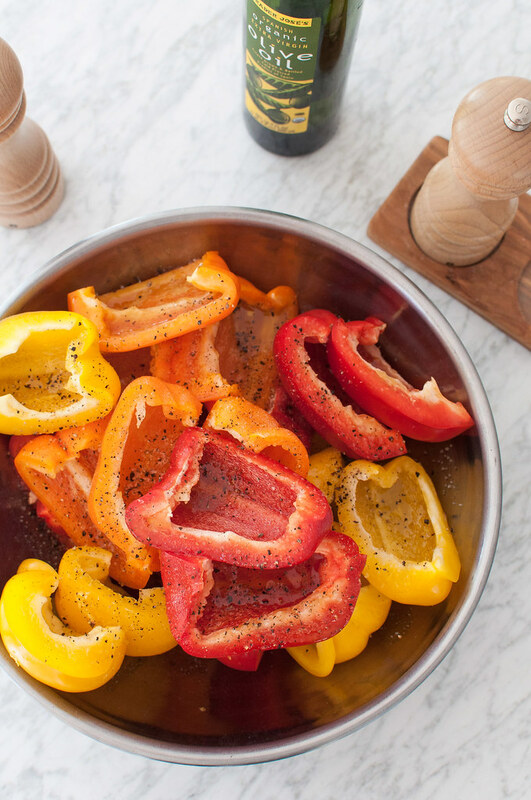 In a large mixing bowl, toss peppers with 3 tablespoons oil and plenty of salt and pepper, then arrange in a single layer, skin side up on the baking sheet. Cover tightly with more foil, then bake about 40 minutes, or until very tender. Remove from oven carefully, as hot liquid might have accumulated. Meanwhile, combine parsley, basil, garlic, and 4 tablespoons oil in a food processor and pulse until finely chopped (like a pesto). Add breadcrumbs, oregano, and salt and pepper (how much?) and pulse until just combined to avoid pulverizing the breadcrumbs. 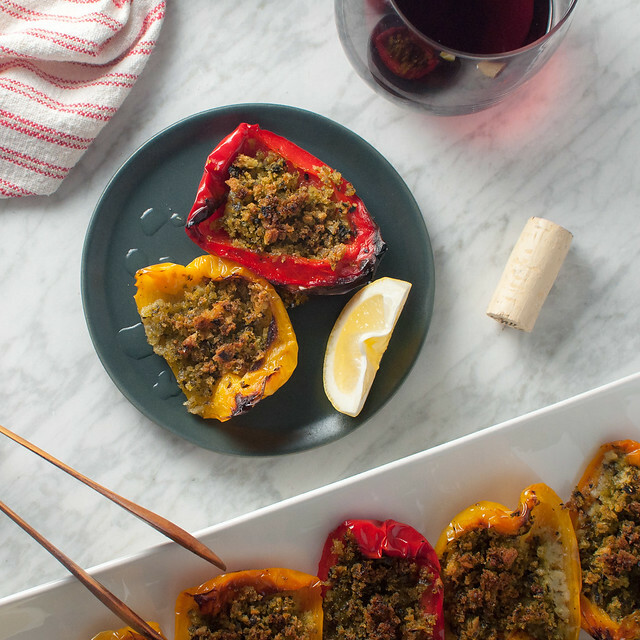 Uncover roasted peppers and turn skin side down (you don't need to drain any moisture from the tray). 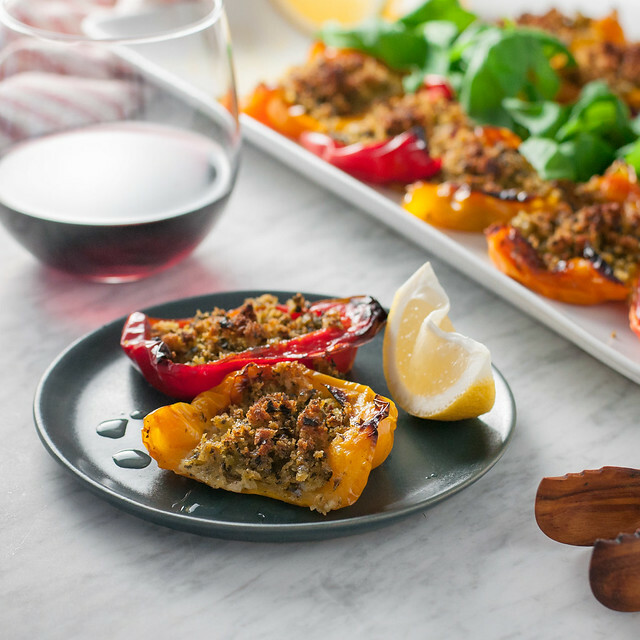 Spoon a heaping tablespoon of the crumb mixture onto each pepper, then drizzle 2 tablespoons oil over all. Bake another 45 minutes or until both the breadcrumbs and the skins of the peppers brown deeply. After cooling slightly, transfer to a serving plate, sprinkle with more salt and pepper (and any leftover fresh herbs), and serve warm immediately, or up to 4 hours later, alongside fresh lemon wedges. Adapted from The River Café Classic Italian Cookbook via Bon Appetit, August 2012. Next time I make these, I plan to mix a little smoked paprika into the breadcrumb mixture to play up the sweet and smoky peppers even more! Give it a try if you have some. Those look absolutely delicious! Looking forward to giving them a try one of these days. Your photos make me want to pluck a pepper right off the screen and pop it into my mouth. Awww thank you Kathryn–that is the best compliment!